Despite the place being full, I have to say it's eerily quiet. If you took away the music, I'd say I've been at noise chess tournaments. Aside from the eternal cricket song you get at every poker comp, there's barely a murmur. Everyone concentrating. I wish to retract the above statement. Rastafish is sitting next to Neil Channing. 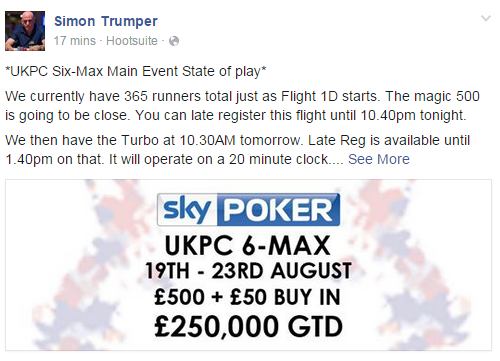 Want to play tomorrow's UKPC Six Max Main Turbo on the cheap? 25 mins until the last chance satellite. 5 seats GTD. This Day 1d is much easier. Turned nut flush vs king flush then flopped a set rivered quads vs an overpair. Easy game @SkyPoker UKPC. Best dressed in the comp, Tighty? apart from your sartorial elegance mr 33,725 and keep missing?